Empanadas—when done well—really are a work of art. The flaky, beautifully-golden, handheld treats packed with delicious savory or sweet fillings can fortunately for us be found all over Los Angeles. From baked and fried versions, meat-filled and vegetarian, traditional Argentinian and other South American versions to more modern American twists, L.A. offers an impressive range of empanadas for all. Whether you&apos;re showing up to a party with a welcome dozen or two, or just looking for a tasty snack, here are our favorite empanadas around L.A. This cozy, family-run joint has been cranking out hot and flaky Argentinian-style empanadas since 1985 when owner Norma Gil and her sons opened up shop in Culver City, and have since added a Costa Mesa location. You can choose from a range of meat-filled options such as spicy chicken, ham and cheese or ground beef, as well as vegetarian versions, including spinach, eggplant and the excellent, fiery picante. We also recommend traditional criolla, which is filled with ground beef, egg and raisins. They come with a great garlicky sauce, though you may want to order up the house chimichurri as well. The empanadas are lightly fried and fairly good-sized, so two or three should be enough depending on how hungry you are, or you could opt for the party-pleasing cocktail size that are about half as big and available by the dozen in each flavor. Oh, and definitely save room for their caramel-filled cookies known as alfajores. Just don&apos;t forget to bring cash! These delectable Argentinian empanadas are baked, also known as Mendoza-style, and have a deservedly loyal following since 2003 from their restaurant and food truck, both cheerfully painted red. And while their golden-hued crescents are a bit on the small side, they&apos;re packed with flavor and give you the chance to try several flavors, each with the name helpfully seared on the crust. You can opt for a wide range of fillings, including great meat renditions like spicy steak, lamb and ground beef, but we definitely recommend exploring the veggie options like spicy mushroom and spinach, eggplant and mozzarella with tomato and basil. And you&apos;ll definitely want some of their garlicky chimichurri sauce. The Empanada Factory is located at 2513 S Robertson Blvd., Beverlywood, (310) 836-5944, and you can usually find their truck at the Mar Vista Farmers&apos; Market on Sunday mornings. This West 3rd Street favorite offers a mind-boggling variety of baked empanadas, perhaps the biggest selection in town, so you can find something for everyone. You&apos;ll find everything from more straightforward, traditional options like ground beef with olives and egg or corn, to internationally minded versions like Filipino chicken, samosa veggie, carnitas and even the Cuban with roasted pork, ham, mustard, cheese and pickles. They even have seafood options, as well as dessert empanadas, including dulce de leche, guava and Nutella. 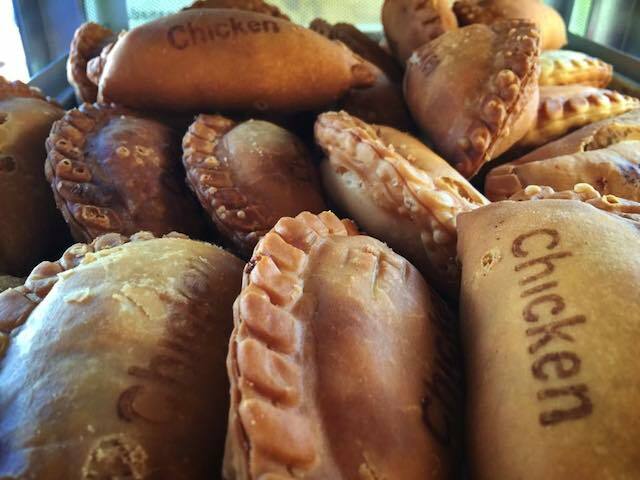 Each empanada goes for about $3 to $4, and if you can&apos;t make up your mind you can go for the assorted dozen. You won&apos;t regret it. Nonna&apos;s Empanadas is located at 8570 W 3rd St, Beverly Grove, (310) 385-0445. While you may know Porto&apos;s as one of the best Cuban bakeries around with their excellent cakes and addictive meat pies and fried potato balls, they also turn out incredible empanadas that should not be overlooked. Their chicken one—packed with shredded meat and vegetables—is a crowd-pleaser, especially when you order a platter of the party-sized ones. Or you may want to go the sweet route with their apple, mango or pineapple versions. If you&apos;re ordering a lot, we definitely recommend calling ahead as they can sell out quickly. Porto&apos;s has locations in Burbank, Glendale and Downey. This lively Chilean spot serves up massive empanadas that are baked to a luminescent golden-brown with a range of fillings both savory and sweet. 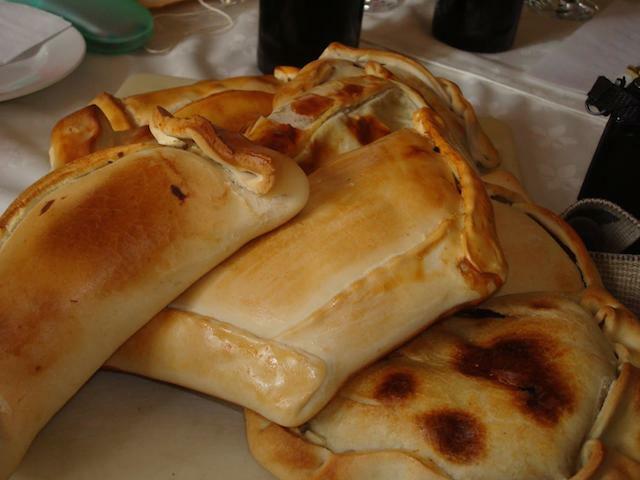 We recommend the spinach and cheese and the traditional empanada de pino, stuffed with ground beef, sauteed onions, olives and hard-boiled eggs. And the spicy green Chilean salsa is a great complement. You can grab a box to go—if you order six they&apos;ll usually throw in one for free—or stick around to explore the rest of the menu and maybe even catch some live music in the evenings. While Colombian-style empanadas don&apos;t receive as much recognition as some of their counterparts, the small golden-fried crescents at La Fonda Antioqueña are definitely worth checking out. Made with masa instead of the flour based-shells found elsewhere, the beef and chicken variety are packed with flavor and at $1.50 each, are a a deal. Though chances are you&apos;re probably going to want to order them with one of their massive platters of Colombian specialities like the bandeja paisa platter. Another welcome variation on the flour-based empanada shell is the sweet plantain version available at this hotspot for upscale Mexican fare. The plantains are roasted until they burst, mashed into a dough and then wrapped around delcious black beans. They&apos;re then topped with a fiery salsa, along with a crema to cool things down. You&apos;re going to want to devour many of these two-bite-sized treats. Border Grill as multiple locations including Santa Monica, Downtown, LAX, Las Vegas and their food truck. 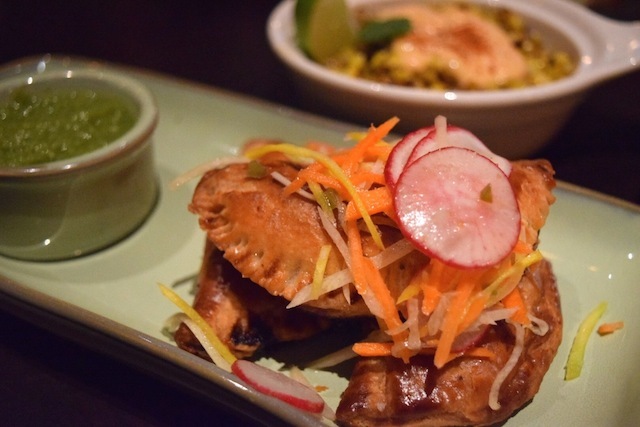 This El Segundo newcomer offers an amazing, flavor-packed "Nuevo Rancho" take on the empanada. Their oxtail picadillo empanadas come with a supremely flaky and buttery crust, and are packed with succulent oxtail meat and served with a tomatillo salsa. They&apos;re definitely on the more "gourmet" side of the usual grab-and-go variety, but totally worth it. Plus you can order from the rest of their excellent menu, which includes killer cocktails and a great craft beer lineup. This laid-back Argentinian restaurant, bakery and market offers three different locations across the Valley where you can enjoy their traditional baked empanadas. 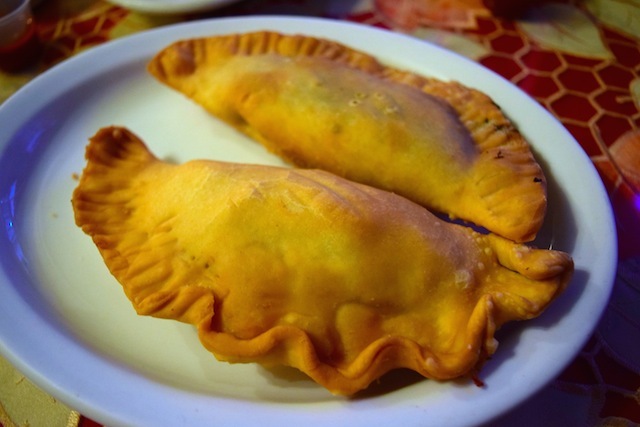 While they offer both fried and baked empanadas, we lean more towards the baked variety with great classic fillings like ground beef, ham and cheese, corn and spinach, though there&apos;s also a tuna one if you prefer. You can also stock up on all your Yerba Mate needs in the market. 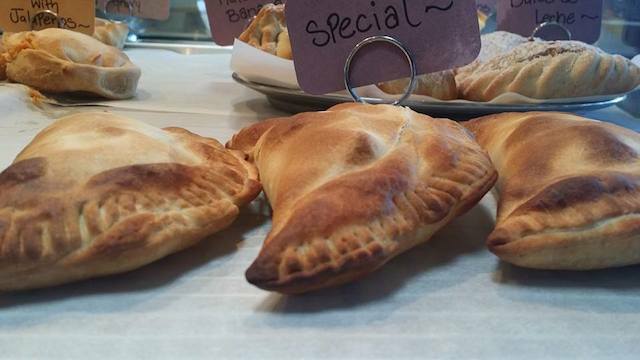 This family-owned Burbank operation specializes in baked Mendoza-style Argentinian empanadas in great variety of flavors, each of which can be identified by their individualized adorable shapes. While you can count on the classics like corn, potatoes, beef, chicken or spinach, they also have stellar twists like a breakfast one with scrambled eggs and bacon, biscuits and gravy, as well as vegan options like quinoa and lentils or soy chorizo with potatoes. And you&apos;ll want to check out their sweet ones too like Nutella and banana, and keep an eye out for new additions to the menu. You can also choose from a variety of sauces including chimichurri and a green tomatillo salsa. They also cater and if you live within six miles they&apos;ll even deliver. This South L.A. institution—which has added a location in Lomita—is not only a great place to stock up on Argentinian and South American pantry staples, cuts of meat and more, but their flaky, traditional empanadas are worth the trip alone. Here they just stick to the classics with spinach, chicken and spicy beef as some of the standouts. You can order them in hand-held size, which are reasonably priced around $1.60 each or oder ahead by the dozen in miniature "copetin" size for a party. Continental Gourmet Market is located at 2921 Prairie Ave, Hawthorne, (310) 676-5444 and 25600 Narbonne Ave, Lomita, (310) 530-3213. 60-year old iconic restaurant Casa Vega offers a unique variation with their hulking Burrito Empanada hybrid. Filled with your choice of chicken, beef, or pork, along with refried beans before it&apos;s fried, this beast is then topped with salsa, Monterey Jack cheese, guacamole, and sour cream. You&apos;re going to need a margarita with this one.